Ethiopia is five times the size of the UK. 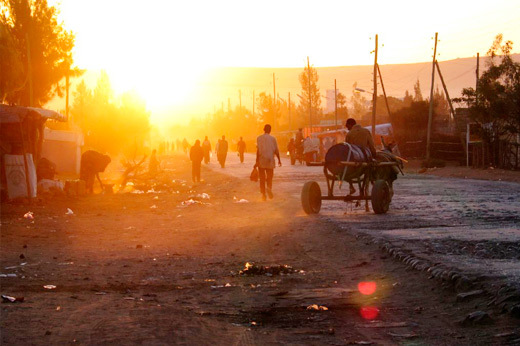 It is one of the poorest nations on earth (ranked 171/182) with a population of about 100 million. From the north and running down the centre are the Abyssinian Highlands with peaks over 4000 metres. To the west of the chain the land drops to the grasslands of Sudan; to the east are the Somali region and deserts of the Afar. South of Addis Ababa, the land is dominated by the Rift Valley Lakes. The nation is torn by social, political and economic crisses, hostility with its neighbours, the Eritrean war, corruption and a large divide between rich and poor. PartnerAid has responded to the situation by meeting two fundamental needs: a children's home as well as a support project to help impoverished children to access education. New Life Development Project (NLDP) is an NGO registered locally in Ethiopia. For over 23 years NLDP has been providing for children from disadvantaged backgrounds and the main focus is to help those who would have little chance of a good education because of poverty, persecution or other circumstances. It is the charity’s aim that these children will become good citizens in the future who will help their own people to come out of poverty and improve their lives spiritually, physically and economically. At present there are many vacancies available for well educated people, and those who graduate from university, especially in the rural areas. Instead of being indoctrinated by radical religious teachings, which is a growing trend especially in the Eastern part of the country as well as the Horn, they learn to live in love and with respect for those of different opinions and faiths. NLDP is proud to have already produced many fine young men and women who are now able to fend for themselves and their families. Many are currently working in well-paid positions in private business, in the public sector and as lecturers in universities. Due to their unique up-bringing in a multicultural, multilingual setting, and because they have been exposed to various worldviews, they are now able to be bridge persons between the different ethnic and religious groups in the country as well as international workers. 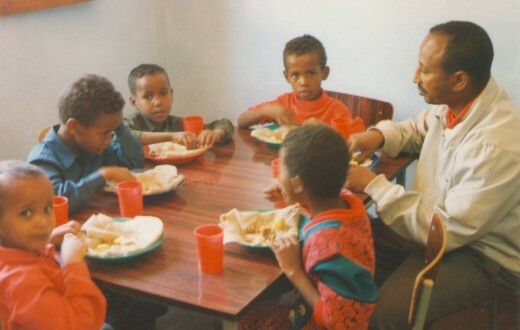 NLDP provides a safe environment for 24 children where they can grow up in a peaceful area of Ethiopia and have a secure home where they are loved and guided. At the start of 2018 there were 10 children living in the NLDP home. A further 14 who have lost one or both parents, live with mothers or grandparents. Two are at university. They are enrolled in the local schools and it is the objective of the project to support them until they have completed grade 12 and possibly after that through university or vocational training. The children have performed well in the schools and this year one boy is being supported through University where he is studying for a degree in public health. As children leave to go to university spaces for new children become available. Each child is sponsored while living in the project’s houses and if more sponsorship becomes available new children can be included. The children at home with mother or grandparents are provided with school uniforms and all the materials they need for their education, and some financial support to buy food. So far funds have come through general donations but now there is an urgent need to find sponsors for the children to continue their support. During July NLDP was able to host a camp in Southern Ethiopia for 20 children and youth, some from the project and some from the community. It was a good opportunity to change the environment and enjoy the lush vegetation in that area which is also blessed with hot springs which were used on a weekly basis for fun and to teach swimming. In addition there was hiking in the nearby mountains and forest. As well as leisure and sport, good use was made of some native English speakers acting as voluntary teachers; children were taught English language along with other subjects including math, history, peace making and handicrafts. The youth in high school and university came to help teach and manage the event too. Idle is the most recent of the NLDP students to graduate from university; here is his story. Idle came to the NLDP when he was about 6 years old. His father was a professor at a government university. Unfortunately his father was killed and his mother had no opportunity or money to get an education for him. Through an NGO for which his father had worked, Idle came to the Project with his older brother and was able to start in Grade 1. He was a diligent boy who learned well and attained good grades. After completing Grade 12 with a good result, he was able to join Adis Ababa University to study political science. He worked very hard and graduated 3 years later as the best student of his group. Soon he found work as an assistant lecturer at another university where he worked hard for a year. Then he got the opportunity to study for his MA and he chose peace and security studies. Now he is finishing his Masters thesis, and hopes to be back in teaching at the university as professor. He has been helping with the children's project whenever he has an opportunity, especially during the summer holiday, and he became a member of the management board of the project. Would you consider sponsoring a child? If you do you will be playing a big part in aiding the child’s development and share in the joy of seeing the difference it makes and the advantages they gain in life. Sponsorship for one child supported in the community is GBP 30 per month. Sponsorship for one child living in the NLDP home is GBP 75 per month.